As a result, a doubt has come to my mind that perhaps Ramakrishna Paramahamsa was a vegetarian. But I cannot confirm this without checking the biographies written by His direct disciples. I know many people will argue that Bengalis treat fish as vegetarian but the following quote, again from Swami Vivekananda seems to indicate that fish was seen Swami Vivekananda as non-vegetarian. So do any of those 3 biographies indicate Shri Ramakrishna Paramahamsa ate meat or fish? 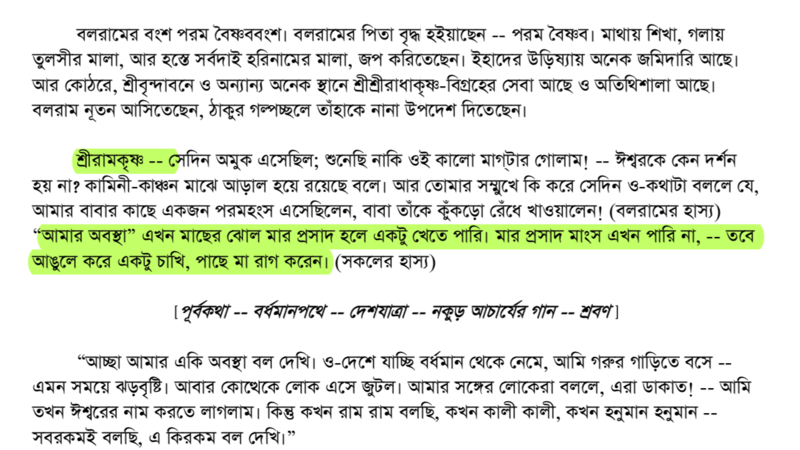 I don't have the book in English so have no other option than attach the image in Bengali. This is what you wanted. This is from "Astom porichad" of 1st part of kathamrita. In Bengali pdf, it is in page no. 92. Please have a look on kathamrita. Gospel Of Sri Ramakrishna is English translation of Sri Sri Ramakrishna Kathamrita by Mahendranath Gupta. The book describes conversations of Sri Ramakrishna with his disciples, devotees, and visitors, recorded by Mahendranāth Gupta, who wrote the book under the pseudonym of "M."
I will provide an answer from this book translated into English by Swami Nikhilananda. Sri Ramakrishna says he can eat fish soup it was offered Goddess Kali beforehand and jokingly says he will taste sip of meat, to avoid wrath of Goddess, if it was offered to Kali beforehand. This is what Swamiji says to his devotees Balaram and M (Mahendranath Gupta). Swami Ramakrishna also says the same to other devotee Adhar. ADHAR (to the Master): "Sir, I have a question to ask. Is it good to sacrifice animals before the Deity? It certainly involves killing." MASTER: "The sastra prescribes sacrifice on special occasions. Such sacrifice is not harmful. Take, for instance, the sacrifice of a goat on the eighth day of the full or new moon. "I am now in such a state of mind that I cannot watch a sacrifice. Also I cannot eat meat offered to the Divine Mother. Therefore I first touch my finger to it, then to my head, lest She should be angry with me. "Again, in a certain state of mind I see God in all beings, even in an ant. At that time, if I see a living being die, I find consolation in the thought that it is the death of the body, the soul being beyond life and death. "One should not reason too much; it is enough if one loves the Lotus Feet of the Mother. Too much reasoning throws the mind into confusion. You get clear water if you drink from the surface of a pool. Put your hand deeper and stir the water, and it becomes muddy. Therefore pray to God for devotion. "Behind Dhruva's devotion there was desire. He practised austerities to gain his father's kingdom. But Prahlada's love for God was motiveless-a love that sought no return." We can consider Swami Ramakrishna was following Scriptures which say one doesn't incur any sin if he/she eats meat offered to Goddess. Not the answer you're looking for? Browse other questions tagged non-vegetarian vivekananda ramakrishna .